My friends Ajar and ElJay come over for our weekly burger and game night on a regular basis. Sometimes we play games that we own, sometimes they bring over games. I bought a few games thanks to them, including Ascending Empires and Elder Sign, which I should really get around to reviewing. They also own a few games that were former Kickstarter projects, and I really wish I’d gotten in on them sooner. One example is Zombicide by Guillotine Games, which is a cooperative boardgame for up to six players. The initial Kickstarter brought in over $780,000USD last year when it launched, and is an incredible hoot to play. One time and I was hooked. Unfortunately I missed the first edition as well as all the Kickstarter backer exclusives, such as additional figures, bonus dice, and optional heroes. You can still buy the standard set, but you won’t get awesome heroes in the likeness of Chuck Norris or Machete. ElJay sent me a message on Sunday with a link to the Kickstarter for the Zombicide expansion. By the time I clicked the link and looked at the different award levels the project had already brought in $70,000. Apparently it smashed its goal four minutes after going live, and as of this writing they’ve raised $670,000 USD with 25 days to go. I think they’ll hit at least $850,000USD and possibly a million. However, that’s putting the cart before the horse. 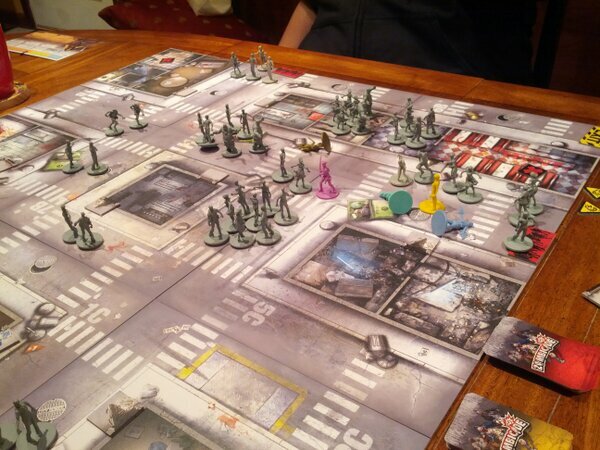 Let me tell you about the core Zombicide game. The base game pits you and up to six players against a horde of zombies. Each of the ten scenarios are played out on 9 different tiles. There are six different survivors to choose from, each with unique abilities. The base game includes 55 zombie figures, and all of the miniatures are well sculpted and have awesome detail. ElJay was in the middle of painting hers when we played, and all of the minis were in a primer gray that added to the zombies’s already creepy visage. The different scenarios range in complexity and time commitment. The game says 20 minutes to three hours. It took us close to two hours to play Mission #1, but that’s because most of us were new and we also had a lot of other stuff going on that interrupted our play. The game moved quickly and I was extremely surprised that so much time had elapsed. Game play is super easy to pick up. Ajar and ElJay had played before, and since they already knew how to “run” the game we just had to worry about playing our characters. The explanation took roughly five minutes, and after a single round of play anyone with moderate gaming experience will understand what’s going on. Each character card has a chart at the top, broken up into blue, orange, and red zones. Everyone starts in the green zone, at the number 0. When a character kills a zombie they earn an experience point. Characters get experience points for completing tasks in each scenario. In our example, a character got five experience points when they found food. Two things happen when you “level up” into a new color zone. Good news! Your character gains a new ability. Sometimes you get to choose, so that’s fun and adds to the replay value of the game and allows different players to put different spins on each character. You can do as many of these as you want per turn except for the search action, which you may only do once. There’s a ton of equipment, too. Fire ax, machete, semi-auto pistol, frying pan (default weapon, it blows), a double barreled shotgun, a full-sized UZI, katana, so on and so on. Each weapon has different attributes. Look, the longer I type this write up the more excited I am to play the base game again and anxious for the Kickstarter to wrap up. You should get ahold of all of your friends and see who has this game, because it’s awesome. If you missed the base set like I did, there’s an award level that includes the base game plus the new mall and prison expansions. If you back the Kickstarter project you will get a TON of exclusive content, such as extra zombies, special zombies, and exclusive heroes. Yes, it’s a pretty steep investment (I’ve already pledged $240) but it’s a massive game. The theme and cooperative nature of the game is a natural fit for my peer group, and we’re going to get a ton of playtime out of it. Check out the Kickstarter, and if you can’t wait for the expected delivery date of September 2013 you can buy the starter set for less than $75 on Amazon.com.